Chronic kidney disease is associated with elevated cardiovascular risk, and heart failure and arrhythmias are the biggest causes of cardiovascular death in this population. Increased arterial stiffness is a hallmark of chronic kidney disease and is associated with adverse alterations in cardiac structure and function that may predispose to an increased risk of cardiovascular death. These changes are already apparent in early kidney disease, which is highly prevalent in the developed world. The mechanisms underlying increased arterial stiffness in chronic kidney disease are undoubtedly complex, but an understanding is paramount to enable the development of novel therapeutic strategies to prevent or reverse this pathophysiology and therefore reduce the cardiovascular disease burden in this high-risk cohort. Although about 50% of all ESKD deaths are due to cardiovascular disease, only 18% of these are attributable to vasculo-occlusive diseases such as myocardial infarction, the remainder being attributed to sudden cardiac death, arrhythmia and congestive heart failure (CHF).8 Heart failure is a major cause of morbidity and mortality in CKD with incident rates three to four times higher than in non-CKD subjects.9 Thus there is increasing evidence that structural heart disease, leading to CHF and sudden cardiac death, rather than occlusive arterial disease, is the leading cause of cardiovascular mortality in both ESKD and early-stage CKD. Powerful evidence suggests that increased arterial stiffness is a major cause of this structural heart disease. There appear to be two distinct vascular pathologies occurring in patients with CKD: atherosclerosis and arteriosclerosis.10 Atherosclerosis is an intimal disease characterised by fibro-atheromatous plaques and vascular occlusion. Atherosclerotic lesions in CKD are characterised by increased plaque calcification and increased intimal and medial thickness.11 Arteriosclerosis is a disease of the arterial medial layer. Increased collagen content, calcification and hyperplasia and hypertrophy of vascular smooth muscle cells (VSMC) all result in arterial wall hypertrophy and increased stiffness.10 Although associations have also been established between the degree of arterial stiffness and atheromatous plaque burden,12 recent studies have failed to demonstrate a significant influence of traditional atherosclerotic risk factors on the development of arteriosclerosis,13 suggesting that alternative pathologies are driving this process. Although endothelial dysfunction and intimal disease are known to contribute to arterial stiffening, the relationship between arteriosclerosis and atheromatous disease remains poorly understood. 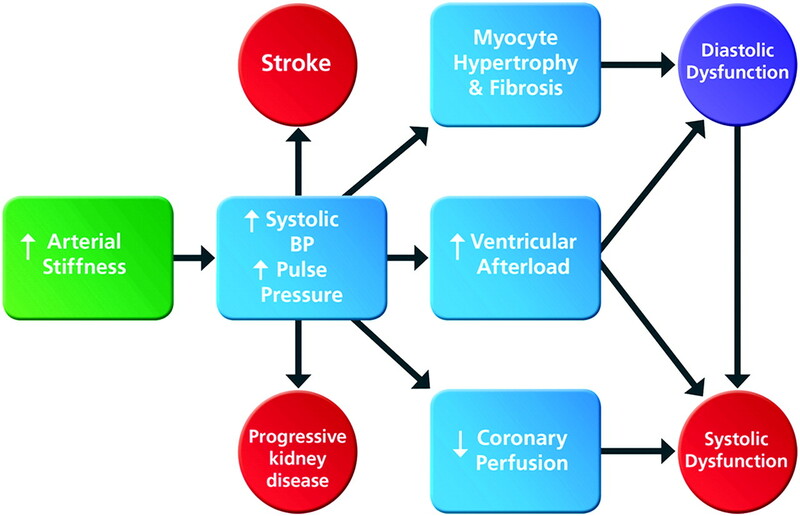 Consequences of increased arterial stiffness in chronic kidney disease. Increased arterial stiffness leads to increases in systolic blood pressure (BP) and pulse pressure causing myocyte hypertrophy, increased ventricular afterload and reduced coronary perfusion, resulting in diastolic and systolic dysfunction and ultimately congestive heart failure. Raised systolic and pulse pressures also promote further vascular damage increasing the risk of stroke and further loss of kidney function. Cardiac function is physiologically matched with arterial function through ventricular–arterial coupling to ensure maximum cardiac work and efficiency.22 When arterial stiffness increases, the left ventricle generates greater end-systolic pressures that enhance ventricular systolic wall stress and increase ventricular stiffness. These compensatory adaptations maintain cardiac performance with enhanced contractility at rest, but at a price: cardiac reserve is reduced, diastolic function is impaired and the cardiovascular response to alterations in pressure and volume load is blunted leading to haemodynamic instability.22 Myocardial oxygen consumption also increases, promoting subendocardial ischaemia.23 Increased ventricular stiffening further impairs diastolic coronary perfusion through increased compression of the coronary microvasculature.24 While this is a common feature of advanced disease characterised by left ventricular hypertrophy (LVH), it is often present despite normal ventricular wall thickness.22 Reduced aortic distensibility also correlates with reduced exercise capacity despite normal or enhanced left ventricular systolic function.25 Increased arterial stiffness due to CKD may therefore underlie many cases of heart failure with preserved ejection fraction, otherwise known as diastolic heart failure. Cardiovascular risk and arterial stiffness are both increased with only minor reductions in renal function.33 Aortic distensibility measured by cardiac magnetic resonance imaging is reduced compared with controls in stage 2 and 3 non-diabetic CKD.27 An understanding of the potential mechanisms underlying increased arterial stiffness in CKD is paramount for devising strategies to prevent or reverse this pathophysiology (figure 2). Potential mechanisms of increased arterial stiffness in chronic kidney disease. Alterations in the extracellular matrix and endothelial dysfunction are promoted by advanced glycation end products (AGE), activation of the renin–angiotensin–aldosterone system (RAAS), chronic inflammation and vascular calcification, all of which are hallmark features of chronic kidney disease. Vascular calcification is closely linked with chronic kidney disease–mineral bone disorder (CKD–MBD) and raised serum phosphate (PO4). Several of these features typify the ageing process but appear to be accelerated in patients with chronic kidney disease. They are also influenced by some aspects of diet such as high sodium or phosphate intake. The biomechanical properties of the arteries are largely dependent on the relative quantities of collagen and elastin, the main scaffolding proteins of the extracellular matrix (ECM). Numerous studies have shown that the large arteries stiffen with age with overproduction of abnormal collagen fibres and relative loss of elastin from the ECM.34 The elastin lamellae become sparser with signs of fragmentation and calcification, while collagen molecules progressively acquire cross-links. A major unresolved question is whether these changes are truly time-dependent or reflect exposure to the risk factors listed below. Similarly, the possible effect of the age-related decline in glomerular filtration rates on arterial stiffness remains unknown. Interestingly, recent experimental evidence suggests that nitric oxide-donating drugs may reverse the relative loss of elastin that occurs with age35 and improve endothelial function and cardiac hypertrophy independent of blood pressure.36 These agents may thus have some potential to prevent or reverse the increasing arterial stiffness associated with ageing and CKD. The mechanisms underlying ECM changes in CKD are currently undetermined but matrix metalloproteinases (MMPs) have been implicated. These endopeptidase enzymes regulate the ECM and are produced by vascular and inflammatory cells. Increased MMP production enhances collagen and elastin turnover through enzymatic cross-link degradation,38 causing unravelling and weakening of the ECM. Doxycycline, a non-specific inhibitor of MMP, improved elastic fibre integrity and reduced arterial stiffness in animal models of Marfan syndrome.39 There are data supporting the MMP mechanism in hypertensive patients40 and there is also accumulating evidence in CKD. Vascular MMP activity in patients with ESKD is increased compared with healthy controls,41 highlighting a potential target for future therapeutic intervention with MMP inhibitors. Levels of circulating AGE correlate directly with serum creatinine in patients with diabetic and non-diabetic CKD.45 46 Advanced glycation end products accumulate in ESKD as demonstrated by skin autofluorescence and are independently associated with increased aPWV47 and with mortality. Although there is some suggestion that AGE are implicated in the development of arterial stiffness in CKD, this finding is not universal.46 Hypertensive subjects and older patients treated with AGE cross-link breakers demonstrate significant reductions in arterial stiffness and endothelial dysfunction.48 49 Further studies are required to determine whether dietary AGE restriction or the use of AGE cross-link breakers might be an effective method of reducing arterial stiffness in CKD. Replenishment of glutathione using N-acetylcysteine, a cheap and well-tolerated food supplement, has been shown to improve endothelial function and cardiovascular outcomes in two small studies of patients with ESKD,59 60 and further assessment of its potential in reducing arterial stiffness is warranted. Although it is accepted that endothelial dysfunction promotes arterial stiffening, a study of cultured endothelial cells in vitro suggests that stiff arteries themselves further reduce nitric oxide bioavailability through diminished expression of endothelial nitric oxide synthase61; arterial stiffness may therefore be self-perpetuating. Novel agents such as ghrelin appear to improve endothelial dysfunction62 and offer potentially promising avenues for further investigation in CKD. Although commonly regarded as a risk factor for atheroma, a clear association between inflammation and arterial stiffness exists, as demonstrated by studies of conditions characterised by chronic systemic inflammation including rheumatoid arthritis and CKD63 64 as well as studies of inflammatory markers and aPWV in the healthy population.65 More specifically, aortic inflammation, as assessed using positron emission tomography imaging, has recently been shown to influence aPWV.66 The long-term use of immunosuppressive agents in inflammatory disorders is associated with a reduction in surrogate markers of cardiovascular risk67; this may be a potential avenue for treatment, although caution is required in view of the associated complications of such treatment. Inflammatory degradation of ECM elastin has recently been shown to accelerate arterial calcification in animal CKD models,68 prompting potential exploration of the role of immunosuppression and the selective inhibition of elastase enzymes as therapeutic interventions in arterial stiffness reduction. Aldosterone levels, which frequently remain elevated despite treatment with ACEI and ARB, are correlated with arterial stiffness in hypertensive men independently of blood pressure.76 Aldosterone increases arterial stiffness independently of wall stress in subtotally nephrectomised rats given high-salt diets77 and these effects are inhibited by the mineralocorticoid receptor (MR) antagonist eplerenone. MR activation is associated with endothelial dysfunction and activation of VSMC genes involved in vascular fibrosis, inflammation and calcification.78 Additionally, aldosterone upregulates expression and sensitivity of vascular angiotensin receptors in rats.79 The MR antagonist spironolactone inhibits angiotensin II-mediated VSMC proliferation in vitro, reduces aortic and myocardial collagen accumulation80 and reduces oxidative stress and endothelial dysfunction.81 In subtotally nephrectomised rats, spironolactone reduces proteinuria, arterial pressure and cardiac hypertrophy.82 These studies highlight the importance of aldosterone in the development of cardiovascular and renal injury in animal models of CKD. There are limited data demonstrating the influence of MR antagonism on arterial stiffness in human CKD. In a randomised placebo-controlled trial, the addition of spironolactone to ACEI/ARB treatment in patients with stage 2 and 3 CKD significantly reduced arterial stiffness and left ventricular mass, supporting the hypothesis that aldosterone is a major mediator of arterial stiffness and LVH in CKD.83 There was, however, a significant reduction in blood pressure such that a blood pressure-lowering effect on arterial stiffness could not be excluded. Larger studies are required to determine whether such treatment is associated with improved clinical outcomes. A recent meta-analysis of RAAS blockade with either ACEI or ARB in CKD revealed a significant reduction in cardiovascular outcomes and incidence of heart failure in comparison with placebo, although no reduction in cardiovascular or all-cause mortality was noted.84 The mechanism by which this improvement in cardiovascular outcome arises is undetermined, but an assessment of arterial stiffness parameters in such patients may prove to be highly informative. Observational studies highlight the importance of environmental factors such as high-salt diets in the development of hypertension and arterial stiffness.85 Dietary sodium enhances age-related vascular changes by promoting VSMC hypertrophy and increased VSMC tone; it also increases collagen cross-linking and facilitates aldosterone-induced oxidative stress and inflammation.85 In the presence of aldosterone, small increases in plasma sodium concentration decrease nitric oxide release and increase endothelial cell stiffness in vitro.86 Restricting dietary sodium in hypertensive subjects effectively reduces arterial stiffness.87 The Western diet is relatively rich in dietary oxidants, AGE and bioavailable phosphate.88 These substances undergo renal metabolism or excretion and therefore accumulate in CKD. The influence of dietary factors such as sodium, phosphate and pro-oxidant compounds on arterial structure and function in subjects with and without CKD is remarkably poorly understood and is a fertile area for future research. Vascular calcification refers to deposition of calcium phosphate mineral (hydroxyapatite) in cardiovascular tissues. Arterial calcification has been long thought to be a passive process, but there is now compelling evidence that it is actively regulated, involving direct osteogenic gene activation together with suppression of calcification inhibitors. Exposure of VSMC to high concentrations of intracellular calcium and phosphate in vitro results in their phenotypic switch to an osteogenic cell type with upregulation of genes promoting matrix mineralisation and calcium deposition.91 Osteogenic differentiation is driven by upregulation of transcription factors such as core-binding factor α1 (cbfa1) and bone morphogenetic protein, which control expression of osteogenic proteins such as osteocalcin, osteonectin and alkaline phosphatase. Upregulation of transcription factors is induced by hyperphosphataemia, which is prevalent in advanced CKD. A sodium-dependent phosphate co-transporter, Pit-1, facilitates movement of inorganic phosphate into VSMC, which stimulates cbfa1 expression dose-dependently.91 Osteogenic proteins are also expressed in VSMC following their exposure to uraemic serum in vitro92; this occurs independently of phosphate concentration, suggesting that the uraemic milieu, perhaps through oxidative stress, directly induces vascular calcification. Serum phosphate levels still within the reference range are associated with cardiovascular mortality in the general population and in patients with CKD, a renal transplant and ESKD.88 99 In animal CKD models, high dietary phosphate and hyperphosphataemia induce cardiac fibrosis and arterial wall thickening.100 The importance of vascular calcification as a determinant of arterial stiffness suggests that treatments that suppress or inhibit this process may be highly effective in maintaining arterial function. There are a variety of therapeutic targets but powerful phosphate binders are already available. The results of studies determining their influence on markers of vascular calcification and parameters of arterial stiffness may have profound implications for the management of cardiovascular risk in the CKD population. Increased arterial stiffness is associated with structural and functional cardiac abnormalities as well as increased cardiovascular mortality in patients with CKD. 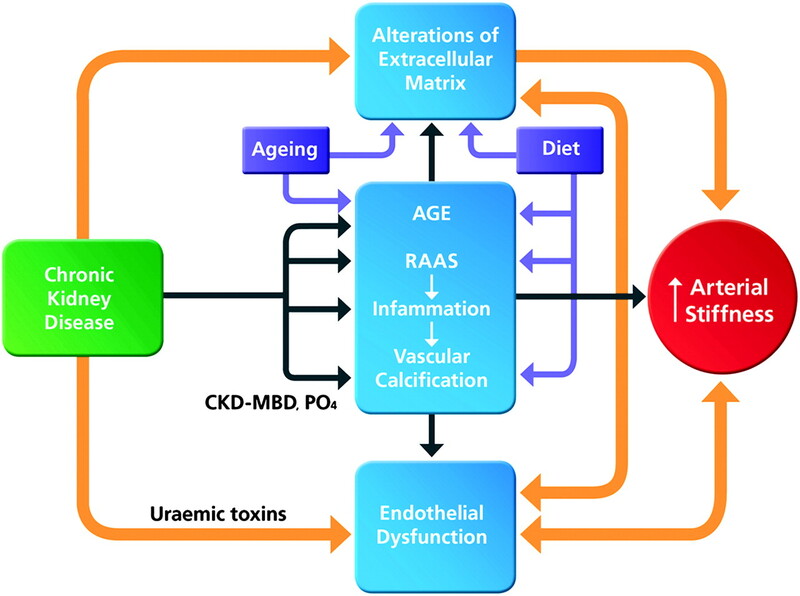 CKD is characterised by accelerated ageing of the vasculature, in which age-related changes of increased arterial stiffening are further compounded by a number of uraemic-related processes. By reducing exposure of the vasculature to processes that induce structural and functional change, we may be able to slow the progression of arterial stiffness and decrease the high cardiovascular risk associated with CKD.
. Chronic kidney disease and the risks of death, cardiovascular events, and hospitalization. N Engl J Med 2004;351:1296–305.
. The glomerular filtration rate in an apparently healthy population and its relation with cardiovascular mortality during 10 years. Eur Heart J 2007;28:478–83.
. Longitudinal follow-up and outcomes among a population with chronic kidney disease in a large managed care organization. Arch Intern Med 2004;164:659–63.
. Prevalence of chronic kidney disease in the United States. JAMA 2007;298:2038–47.
. Which cardiovascular risk factors matter in chronic kidney disease? Nephrol Dial Transplant 2007;22:9–11.
. The number, quality, and coverage of randomized controlled trials in nephrology. J Am Soc Nephrol 2004;15:411–19.
. Definition and classification of chronic kidney disease: a position statement from kidney disease: improving global outcomes (KDIGO). Kidney Int 2005;67:2089–100. USRDS 2006 Annual data report. US renal data system. Bethesda, MD: National Institutes of Health, National Institute of Diabetes and Digestive and Kidney Diseases, 2006.
. Chronic kidney disease and the risk for cardiovascular disease, renal replacement, and death in the United States medicare population, 1998 to 1999. J Am Soc Nephrol 2005;16:489–95.
. The treatment of coronary artery disease in patients with chronic kidney disease. Qjm 2006;99:723–36.
. Morphology of coronary atherosclerotic lesions in patients with end-stage renal failure. Nephrol Dial Transplant 2000;15:218–23.
. Association between arterial stiffness and atherosclerosis: the rotterdam study. Stroke 2001;32:454–60.
. Dissociation of aortic pulse wave velocity with risk factors for cardiovascular disease other than hypertension. a systematic review. Hypertension 2009;54:1328–36.
. Role of pulse pressure amplification in arterial hypertension: experts' opinion and review of the data. Hypertension 2009;54:375–83.
. What is the role of the aorta in directing coronary blood flow? Heart 2008;94:1545–7.
. Hemodynamic patterns of age-related changes in blood pressure. The framingham heart study. Circulation 1997;96:308–15.
. A Meta-analysis of the mechanism of blood pressure change with aging. J Am Coll Cardiol 2009;54:2087–92.
. Time-domain representation of ventricular-arterial coupling as a windkessel and wave system. Am J Physiol Heart Circ Physiol 2003;284:H1358–68.
. Relationship between aortic stiffening and microvascular disease in brain and kidney: cause and logic of therapy. Hypertension 2005;46:200–4.
. Cardiac and arterial interactions in end-stage renal disease. Kidney Int 1996;50:600–8.
. systolic flow augmentation in hearts ejecting into a model of stiff aging vasculature. Influence on myocardial perfusion-demand balance. Circ Res 1995;76:132–41.
. Coupled systolic-ventricular and vascular stiffening with age: implications for pressure regulation and cardiac reserve in the elderly. J Am Coll Cardiol 1998;32:1221–7.
. Coronary circulation in dogs with an experimental decrease in aortic compliance. J Am Coll Cardiol 1993;21:1497–506.
. Evidence of a dominant backward-propagating “suction” wave responsible for diastolic coronary filling in humans, attenuated in left ventricular hypertrophy. Circulation 2006;113:1768–78.
. Cardiac cycle-dependent changes in aortic area and distensibility are reduced in older patients with isolated diastolic heart failure and correlate with exercise intolerance. J Am Coll Cardiol 2001;38:796–802.
. Clinical and echocardiographic disease in patients starting end-stage renal disease therapy. Kidney Int 1995;47:186–92.
. Aortic distensibility and arterial-ventricular coupling in early chronic kidney disease: a pattern resembling heart failure with preserved ejection fraction. Heart 2008;94:1038–43.
. Subclinical abnormalities of left ventricular myocardial deformation in early-stage chronic kidney disease: the precursor of uremic cardiomyopathy? J Am Soc Echocardiogr 2008;21:1293–8.
. Prognostic role of subclinical left ventricular abnormalities and impact of transplantation in chronic kidney disease. Am Heart J 2007;153:656–64.
. Predominance of isolated systolic hypertension among middle-aged and elderly US hypertensives: analysis based on National Health and Nutrition Examination Survey (NHANES) III. Hypertension 2001;37:869–74.
. Systolic blood pressure, diastolic blood pressure, and pulse pressure as predictors of risk for congestive heart failure in the Framingham Heart Study. Ann Intern Med 2003;138:10–16.
. Expert consensus document on arterial stiffness: methodological issues and clinical applications. Eur Heart J 2006;27:2588–605.
. Stepwise increase in arterial stiffness corresponding with the stages of chronic kidney disease. Am J Kidney Dis 2005;45:494–501.
. Ageing of the conduit arteries. J Pathol 2007;211:157–72.
. Effects of chronic treatment with a low dose of nicorandil on the function of the rat aorta during ageing. Clin Exp Pharmacol Physiol 2009;36:988–94.
. The effect of an NO donor, pentaerythrityl tetranitrate, on biochemical, functional, and morphological attributes of cardiovascular system of spontaneously hypertensive rats. Gen Physiol Biophys 2009;28:86–93.
. Aortic changes in experimental renal failure: hyperplasia or hypertrophy of smooth muscle cells? Hypertension 1997;29:770–5.
. Extracellular matrix remodeling and matrix metalloproteinases in the vascular wall during aging and in pathological conditions. Biomed Pharmacother 2003;57:195–202.
. Long-term doxycycline is more effective than atenolol to prevent thoracic aortic aneurysm in marfan syndrome through the inhibition of matrix metalloproteinase-2 and -9. Circ Res 2008;102:e73–85.
. Matrix metalloproteinase-9 (MMP-9), MMP-2, and serum elastase activity are associated with systolic hypertension and arterial stiffness. Arterioscler Thromb Vasc Biol 2005;25:372.
. Upregulation of matrix metalloproteinase-2 in the arterial vasculature contributes to stiffening and vasomotor dysfunction in patients with chronic kidney disease. Circulation 2009;120:792–801.
. Enzymatic and nonenzymatic cross-linking of collagen and elastin. FASEB J 1992;6:2439–49.
. Age-related changes in the glycation of human aortic elastin. Exp Gerontol 2004;39:249–54.
. Advanced glycosylation products quench nitric oxide and mediate defective endothelium-dependent vasodilatation in experimental diabetes. J Clin Invest 1991;87:432–8.
. Advanced glycosylation end products in patients with diabetic nephropathy. N Engl J Med 1991;325:836–42.
. Advanced glycation end products and mortality in hemodialysis patients. Kidney Int 2002;62:301–10.
. Skin autofluorescence, a marker for advanced glycation end product accumulation, is associated with arterial stiffness in patients with end-stage renal disease. Metabolism 2008;57:1452–7.
. Improved arterial compliance by a novel advanced glycation end-product crosslink breaker. Circulation 2001;104:1464–70.
. Advanced glycation endproduct crosslink breaker (alagebrium) improves endothelial function in patients with isolated systolic hypertension. J Hypertens 2007;25:577–83.
. Abnormalities of endothelial function in patients with predialysis renal failure. Heart 2000;83:205–9.
. Accumulation of an endogenous inhibitor of nitric oxide synthesis in chronic renal failure. Lancet 1992;339:572–5.
. Symmetrical dimethylarginine: a new combined parameter for renal function and extent of coronary artery disease. J Am Soc Nephrol 2006;17:1128–34.
. Asymmetric dimethylarginine, C-reactive protein, and carotid intima-media thickness in end-stage renal disease. J Am Soc Nephrol 2002;13:490–6.
. The endothelin system and its antagonism in chronic kidney disease. J Am Soc Nephrol 2006;17:943–55.
. Effects of endothelin-1 and endothelin-1 receptor blockade on cardiac output, aortic pressure, and pulse wave velocity in humans. Hypertension 2003;41:1253–8.
. Blood pressure-independent reduction in proteinuria and arterial stiffness after acute endothelin-a receptor antagonism in chronic kidney disease. Hypertension 2009;54:113–19.
. A selective endothelin-receptor antagonist to reduce blood pressure in patients with treatment-resistant hypertension: a randomised, double-blind, placebo-controlled trial. Lancet 2009;374:1423–31.
. The antioxidant acetylcysteine reduces cardiovascular events in patients with end-stage renal failure: a randomized, controlled trial. Circulation 2003;107:992–5.
. N-acetylcysteine improves arterial vascular reactivity in patients with chronic kidney disease. Nephron Clin Pract 2009;112:c184–9.
. Wall stiffness suppresses Akt/eNOS and cytoprotection in pulse-perfused endothelium. Hypertension 2003;41:378–81.
. Ghrelin restores the endothelin 1/nitric oxide balance in patients with obesity-related metabolic syndrome. Hypertension 2009;54:995–1000.
. Rheumatoid arthritis is associated with increased aortic pulse-wave velocity, which is reduced by anti-tumor necrosis factor-alpha therapy. Circulation 2006;114:1185–92.
. Oxidative stress and inflammation, a link between chronic kidney disease and cardiovascular disease. Kidney Int Suppl 2008;74:S4–9.
. C-reactive protein is associated with arterial stiffness in apparently healthy individuals. Arterioscler Thromb Vasc Biol 2004;24:969–74.
. Aortic inflammation, as assessed by hybrid FDG-PET/CT imaging, is associated with enhanced aortic stiffness in addition to concurrent calcification. Eur J Nucl Med Mol Imaging 2009;36:979–85.
. Methotrexate and mortality in patients with rheumatoid arthritis: a prospective study. Lancet 2002;359:1173–7.
. Arterial and aortic valve calcification abolished by elastolytic cathepsin S deficiency in chronic renal disease. Circulation 2009;119:1785–94.
. Angiotensin induces inflammatory activation of human vascular smooth muscle cells. Arterioscler Thromb Vasc Biol 1999;19:1623–9.
. Effect of angiotensin II and thromboxane A2 on the production of matrix metalloproteinase by human aortic smooth muscle cells. Biochem Mol Biol Int 1995;35:265–73.
. Ramipril reduces large-artery stiffness in peripheral arterial disease and promotes elastogenic remodeling in cell culture. Hypertension 2005;45:1194–9.
. Angiotensin II receptor antagonists and angiotensin-converting enzyme inhibitors lower in vitro the formation of advanced glycation end products: biochemical mechanisms. J Am Soc Nephrol 2002;13:2478–87.
. Long-term trandolapril treatment is associated with reduced aortic stiffness: the prevention of events with angiotensin-converting enzyme inhibition hemodynamic substudy. Hypertension 2007;49:1271–7.
. Impact of aortic stiffness attenuation on survival of patients in end-stage renal failure. Circulation 2001;103:987–92.
. Angiotensin receptor blockade and arterial compliance in chronic kidney disease: a pilot study. Am J Nephrol 2005;25:393–9.
. Association between increased plasma levels of aldosterone and decreased systemic arterial compliance in subjects with essential hypertension. Am J Hypertens 1997;10:1326–34.
. Increased carotid wall elastic modulus and fibronectin in aldosterone-salt-treated rats: effects of eplerenone. Circulation 2002;106:2848–53.
. Aldosterone and vascular inflammation. Hypertension 2008;51:161–7.
. Aldosterone enhances angiotensin II receptor binding and inositol phosphate responses. Hypertension 1992;20:67–73.
. Prevention of aortic and cardiac fibrosis by spironolactone in old normotensive rats. J Am Coll Cardiol 2001;37:662–7.
. Spironolactone improves angiotensin-induced vascular changes and oxidative stress. Hypertension 2002;40:504–10.
. Role of aldosterone in the remnant kidney model in the rat. J Clin Invest 1996;98:1063–8.
. Effect of spironolactone on left ventricular mass and aortic stiffness in early-stage chronic kidney disease. A randomized controlled trial. J Am Coll Cardiol 2009;54:505–12.
. Renin angiotensin system blockade and cardiovascular outcomes in patients with chronic kidney disease and proteinuria: a meta-analysis. Am Heart J 2008;155:791–805.
. Pressure-independent contribution of sodium to large artery structure and function in hypertension. Cardiovasc Res 2000;46:269–76.
. Plasma sodium stiffens vascular endothelium and reduces nitric oxide release. Proc Natl Acad Sci U S A 2007;104:16281–6.
. Dietary sodium restriction rapidly improves large elastic artery compliance in older adults with systolic hypertension. Hypertension 2004;44:35–41.
. Is lowering phosphate exposure the key to preventing arterial stiffening with age? Heart 2009;95:1770–2.
. Associations between vascular calcification, arterial stiffness and bone mineral density in chronic kidney disease. Nephrol Dial Transplant 2008;23:586–93.
. Arterial media calcification in end-stage renal disease: impact on all-cause and cardiovascular mortality. Nephrol Dial Transplant 2003;18:1731–40.
. Phosphate regulation of vascular smooth muscle cell calcification. Circ Res 2000;87:E10–7.
. Phosphorus and uremic serum up-regulate osteopontin expression in vascular smooth muscle cells. Kidney Int 2002;62:1724–31.
. Matrix Gla protein is associated with coronary artery calcification as assessed by electron-beam computed tomography. Thromb Haemost 2004;91:790–4.
. Association of low fetuin-A (AHSG) concentrations in serum with cardiovascular mortality in patients on dialysis: a cross-sectional study. Lancet 2003;361:827–33.
. Association of serum phosphate with vascular and valvular calcification in moderate CKD. J Am Soc Nephrol 2009;20:381–7.
. Lower risk for cardiovascular mortality in oral 1alpha-hydroxy vitamin D3 users in a haemodialysis population. Nephrol Dial Transplant 2004;19:179–84.
. 1,25-(OH)2-vitamin D3 suppresses the bone-related Runx2/Cbfa1 gene promoter. Exp Cell Res 2002;274:323–33.
. Parathyroid hormone, vitamin D, and cardiovascular disease in chronic renal failure. Kidney Int 1999;56:383–92.
. Elevated serum phosphate predicts mortality in renal transplant recipients. Transplantation 2009;87:1040–4.
. Hyperphosphatemia aggravates cardiac fibrosis and microvascular disease in experimental uremia. Kidney Int 2003;63:1296–301. Funding Genzyme Corporation, 4620 Kingsgate, Cascade Way, Oxford Business Park South, Oxford OX4 2SU, UK. Competing interests CJF has received lecture and advisory board fees from Genzyme. All authors are recipients of an unrestricted educational grant from Genzyme Corporation. No medical writers were involved in the preparation of this manuscript.